With a stay at Courtyard by Marriott Wilmington / Wrightsville Beach, you'll be centrally located in Wilmington, within a 10-minute drive of University of North Carolina at Wilmington and Mayfaire Town Center. This hotel is 7.5 mi (12.1 km) from Wrightsville Beach and 7 mi (11.3 km) from Wilmington Convention Center. Make yourself at home in one of the 128 air-conditioned rooms featuring refrigerators and flat-screen televisions. Cable programming and video-game consoles are provided for your entertainment, while complimentary wireless Internet access keeps you connected. Bathrooms have complimentary toiletries and hair dryers. Conveniences include phones, as well as complimentary weekday newspapers and coffee/tea makers. Be sure to enjoy recreational amenities including an outdoor pool and a fitness center. Additional amenities at this hotel include complimentary wireless Internet access, a fireplace in the lobby, and complimentary use of a nearby fitness facility. Featured amenities include complimentary wired Internet access, a business center, and express check-in. Planning an event in Wilmington? This hotel has facilities measuring 2473 square feet (230 square meters), including conference space. A roundtrip airport shuttle is complimentary at scheduled times. 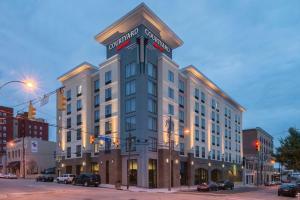 When would you like to stay at Courtyard by Marriott Wilmington / Wrightsville Beach ? Each day we'll check prices and send you an email for your selected dates at Courtyard by Marriott Wilmington / Wrightsville Beach. If you don't have specific dates but would like to check prices for say next weekend or say next month we can check the price too. Click to write a review and share your experience of Courtyard by Marriott Wilmington / Wrightsville Beach with other travellers.